The thyroid is a butterfly-shaped gland that wraps around the windpipe, behind the “Adam’s Apple” area of the neck. The hormones produced by the gland are essential to stimulating metabolism, growth, and the body’s capacity to process calories. The most common thyroid problem is an underactive thyroid — hypothyroidism — which affects women as much as seven times more often men. The risk of thyroid disease increases with age for both men and women. The most common thyroid symptoms typically appear over time, and include weight changes, fatigue, depression, anxiety, and hair loss. Because they are non-specific and usually take time to develop, these symptoms are frequently attributed to lack of sleep, post-partum fatigue, inadequate exercise and diet, stress, premenstrual syndrome, menopause, and aging — leaving many individuals undiagnosed. 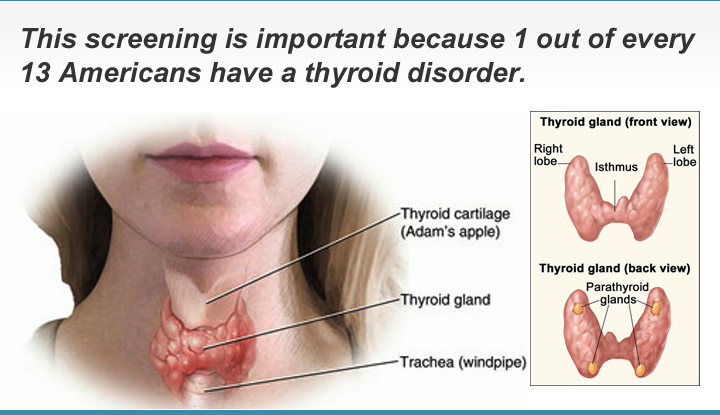 More Info: Learn how we screen for Thyroid Abnormalities.